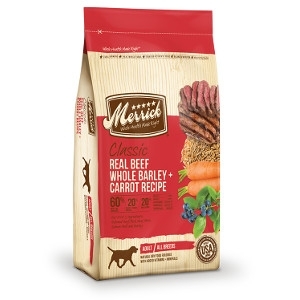 Dogs thrive on quality protein and healthy fats, which is why the Merrick Classic Real Beef with Whole Barley & Carrot is made with high-quality protein, whole grains, vegetables and fruits to provide a natural dog food formula rich in nutrients to support the overall health of your dog. Merrick starts with real and wholesome USDA-inspected deboned beef as the first ingredient with amino acids necessary for building muscle and a healthy metabolism. Our protein rich MERRICK ADULT RECIPE is balanced with 60% beef proteins 20% fresh produce and 20% whole grains ingredients. This food revolution in the dog bowl yields 30% protein for each meal.